Departed Wichita for Missouri warm front. Failed to intercept any noteworthy storm on the front while missing discrete tornadic supercells near starting point. “Thanks team for all the efforts yesterday. If there is one thing I can say about today’s forecast it is that tomorrow in Illinois does indeed look very promising! Two quick observations ahead of the 12Z guidance. The Texas MCS is currently more expansive than the 06Z mesoscale models suggested — see graphics below — and may be squeegeeing much of the richer moisture for southern targets, though considerable recovery is possible given that it is still early in the day. Meanwhile, up north in NE OK and SE KS, a morning MCS predicted by the NAM-NEST has not materialized, and this is one sector actually receiving sunshine right now. This area was worked over by nighttime convection last night so also may have moisture return issues. This area should have the best backed surface flow in the warm sector of the evolving frontal cyclone over Oklahoma by midday. The lack of strong capping suggests that frontal convergence near the boundary may trigger convection early. Today continues to look very problematic for chase target selection. An E-W arcing convective line now passing north of I-40 west of OKC is now gobbling up remaining moisture west of I-35 and looks to continue on northward and perhaps expand to northeast. Meanwhile, continued redevelopments along I-20 west of Abilene TX seem to greatly diminish prospects for the Red River region west of I-35 for this afternoon. The expansive cirrus shield from all this convection is diminishing heating across most of the warm sector other than eastern Kansas. 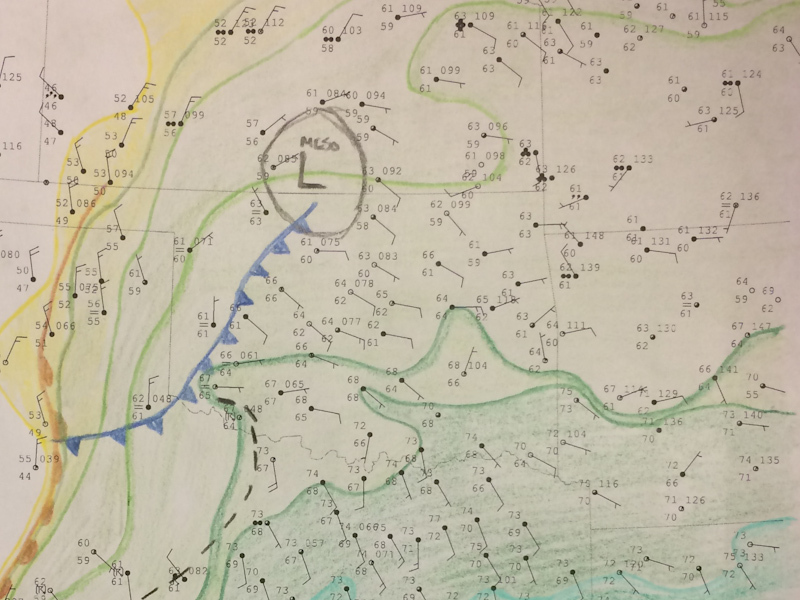 I note an outflow boundary draped E-W in southeast Oklahoma in a richer, less worked-over airmass. This could be a focus for supercells this afternoon if the MCS to the west weakens, but chasing the forested terrain down there is often problematic. “Well – it is going to be a forecast challenge today (yet another cluster situation I think). At the current juncture significant convection is ongoing, particularly into the southwest TX region, and MCSs have cleared eastwards into AR this morning (100mph wind gusts out there last night – bit breezy). Seems likely the only tornadoes of note yesterday were near Seiling and Waynoka, along with the early one down south – and it was very much a needle in a haystack job. This seems to be the order of this week with insufficient capping being advected ahead of these closed lows to hold convection from going upscale. Onto today, a heavily convectively mixed airmass is in place throughout the central plains. Convective reinforcement has driven yesterday’s warm front/stationary front southwards with an orientation from I40 in western OK, extending NEward toward KS City. A dryline drapes south from the front in the far south TX panhandle down into the Big Bend. Convection is already present in the Abilene, TX region, and is already beginning to move NEward. How this convection evolves will play a large role in the day’s evolution. HRRR suggests that the activity near Abilene is poised to be the originator of a large MCS that develops into the 00Z window, propagating E/SE in a very meaty way, and less development further north into SE KS with cells developing here on mass given the uncapped warm sector. Further west there seems to be some potential for storms to develop in the cold core of the low with helicity tracks, but it’s a little hard to work out whether this will evolve given the differences from NAM. Overall NAM has similar thoughts, though the MCS evolves later in the period following dissipation of the current complex and consequently the airmass recovery means it is much beefier and extends further north into SE KS, closing the door on any prospects in that region. “Turtle kind of likes far western MO, just north of Joplin. There's actually some capping over MO right now and the area is getting some sun. Moderate instability approaching the warm front in MO is expected by afternoon. A little speed max or lead impulse is expected to kick out of ne OK/se KS into sw MO between 21z and 0z which could kick off some storms ahead of the advancing MCS action further west. There's some decent backing and shear along the warm front forecast to run near the I-70 corridor. Thoughts would be to catch storms north of Joplin along highway 71 or west along highway 69, stair stepping them if possible to get discrete storms as they approach the warm front to north. The terrain is real nice along those north/south highways but gets squirrelly real quick east of there. We'll have fast highways to make a play for the day 2 as well. Models are pretty progressive and we may find ourselves in central Indiana tomorrow rather than central Illinois. Woodchuck and Turtle got on the road, Duck trailed well behind us having started much furth to the west. We went for the warm front, and tried to hug it as we trekked east across Missouri. It was a long slog through rain and a grind of drive as we meandered down slow highways, behind trucks, and beneath junky storms that failed to organize. We stopped for a break in Sedalia, but somewhere between there and Columbia we called the chase. Team Turtle headed back to my house in Springfield for the night. Woodchuck and Duck regrouped in Missouri to catch storms moving through later that evening. 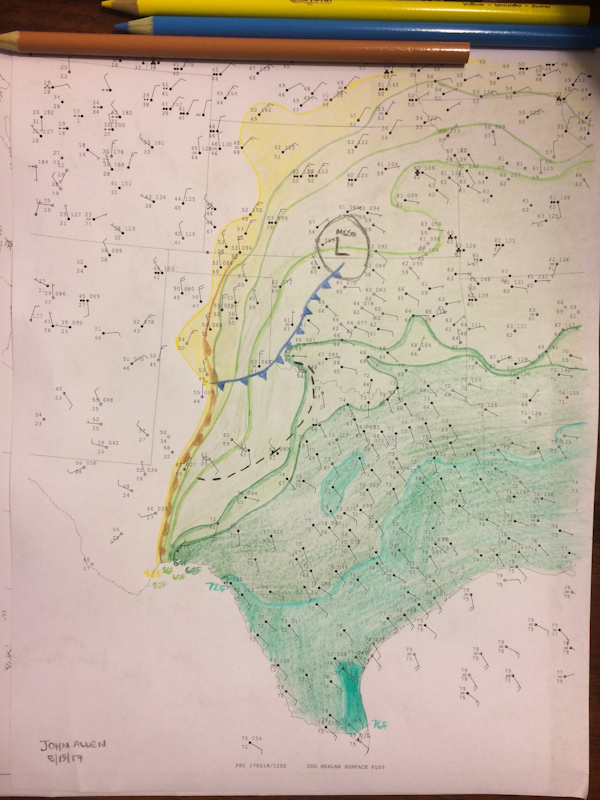 “We began our morning out of a drizzly cold Dodge City, with the prospect of a heavily overworked airmass, a number of boundaries and morning convection overturning the environment south of the Red River above the boundary layer. A trailing frontal boundary extended through northwest OK into the area south of Kansas City, while a dryline lay in west TX. A difficult selection of targets presented itself: supercells forming off the front or dryline in the Red River Valley, the potential for storms under the cold upper low in central KS, and storms perhaps riding the warm front in southeastern KS and western MO. The environment throughout these three regions was characterised by moderate to strong vertical wind shear, modest to moderate instability, with relatively low tornado chances compared with previous days. The difference in starting point and potential for the following day’s target encouraged us eastward to a target area of southeastern KS/western MO. Team Duck started well behind (Dodge City vs Wichita), which lead to a separation in Nevada MO where teams Woodchuck and Turtle headed north to follow the lifting warm front in the hopes of a cell forming to interact with it. Duck proceeded east-northeast toward Jefferson City, and was greeted in MO by a tornado watch, and shortly thereafter, a tornado warned supercell on the book end vortex on the northern side of a persistent MCS over the southwest of MO. We came away with nothing in terms of photos or videos on this chase, having intercepted no discernible storm structure on the warm front. The drive was a grueling grind and a slog through the rain. Adding insult to injury, discrete supercells with photogenic tornadoes formed in the low CAPE airmass right on the surface low near Wichita, not far from where we had started that morning. We were letting the day 2 target influence our positioning, however, and so felt inclined to get east on this chase. That thinking cost us on this chase, but we'd wind up making up for it on the following day. Don't ignore the surface low sleeper target, especially if you're sitting right on it at the start of the day.